One of the benefits of clearing Skirmish 8 and reaching Castle 17 is unlocking Treasure Trove. For F2Ps, it's going to be your most important building for advancing in Lords Mobile. It's like your turf's own private bank. You get to deposit a certain amount of gems and at the end of a certain amount of time, you gain interest and get to collect a payout. There are three deposit times – one week, two weeks or a month. I have always done the month deposits because the rewards are greater. You just need patience. This next statement may seem controversial to some, but here it is. 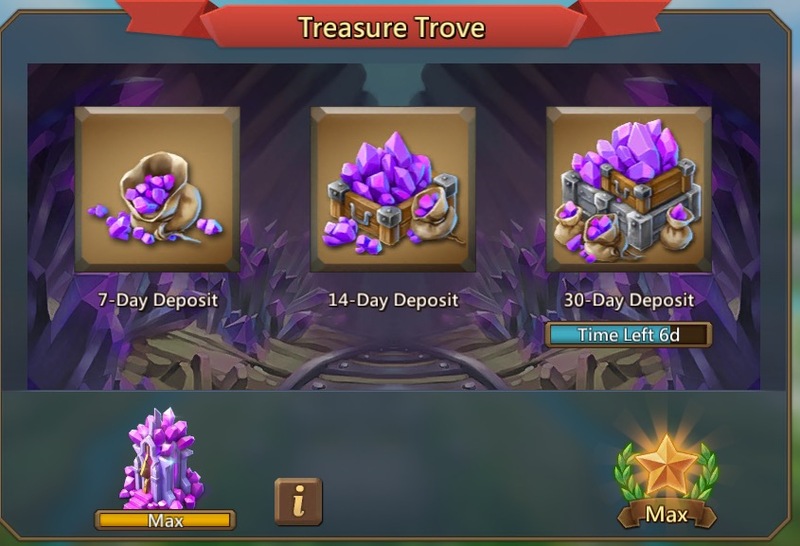 Make maxing Treasure Trove your priority over all other buildings that require special items to be bought to upgrade. Gems will always be your most valuable resource in this game. The other buildings that require special items to upgrade are Battle Hall, Prison and Altar. 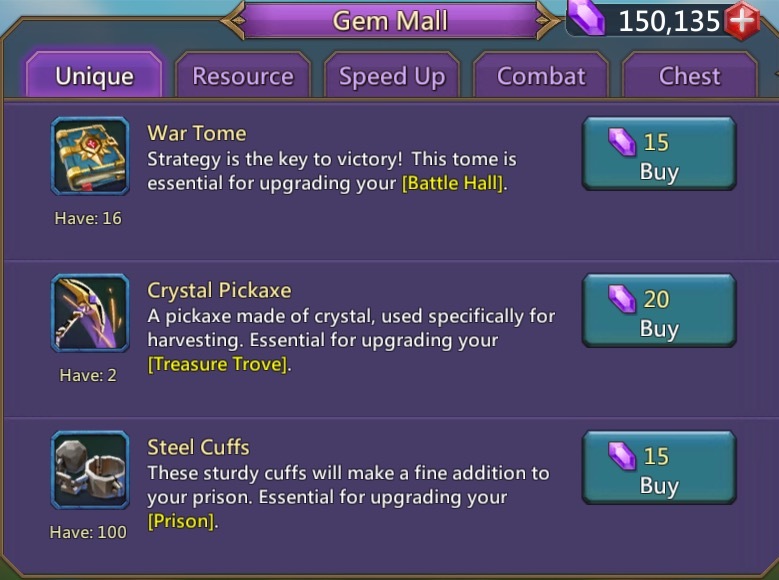 You have to buy War Tomes for Battle Hall, Steel Cuffs for Prison and Soul Crystals for Altar. All these require that you spend hundreds of thousands in gems to get to level 25. You are going to need 600K gems in order to eventually unlock Tier 4 troops. So, it's logical to start maximising your gem collecting as early as possible, right? But, but, but? What about my Battle Hall? I need to be able to rally Darknests in the very least, right? Yes, having an okay Battle Hall is required. Especially for doing Darknest quests during Guild Fest, but a Level 15 Battle Hall is all you will need to do Level 2 Darknests comfortably. Leave the bigger rallies to your P2P guildmates who have big BHs. You get War Tomes as loot and prizes in the game. Use them to upgrade. 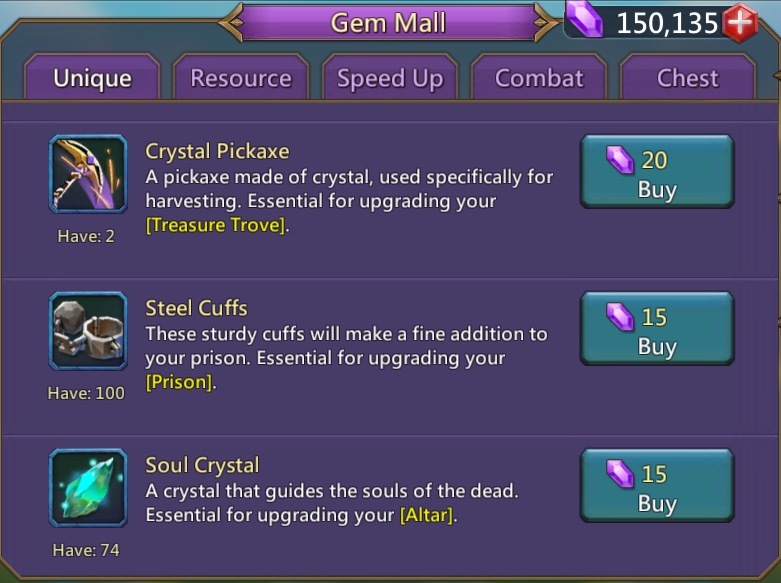 Save your gems for Crystal Pickaxes. 1000 Crystal pickaxes cost 14K gems. You need 10K Crystal Pickaxes total to get from Level 1 to Level 9 Treasure Trove. But it's so worth it! Currently, with my 9 Trove, I get 43K gems from Trove and re-deposit 21K every month. I have maxed my Battle Hall and am currently working on Prison. It takes time, but this is the best way to use your gems if you are F2P. 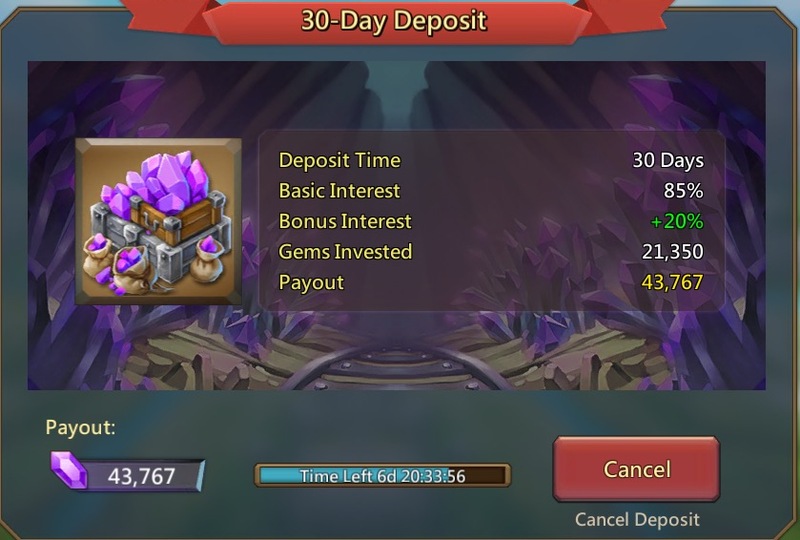 Doing the extra increase gem deposit research is also great! Previous Previous post: [Topic] How was your KVK Last Weekend?